You’ve seen the right-wing version of this film countless times. Charles Bronson made a career out of killing guys like Kevin: the sneering psychopaths we love to hate. But every psycho has a mother. That’s the hook – both in Lynne Ramsay’s new adaptation of Kevin, and Lionel Shriver’s unusual best-seller. This is story of a woman’s private hell. The mood of the film is toxic: polluted love. You want to see Kevin pushed off a cliff. You want to see him hang, see him riddled with bullets. But he lives. This is not a thriller, or a horror story. There is no vengeful resolution, because the heart of the drama isn’t: Who will stop Kevin? It’s: Who’s to blame? His mother is an accomplice to the crime. She’s not the hero. We never see the high-school massacre that drives the film. The colour – blood red – is in almost every scene, but only two killings are ever shown. You don’t need to see what Kevin does, after all. It’s perfectly clear what he’s capable of. 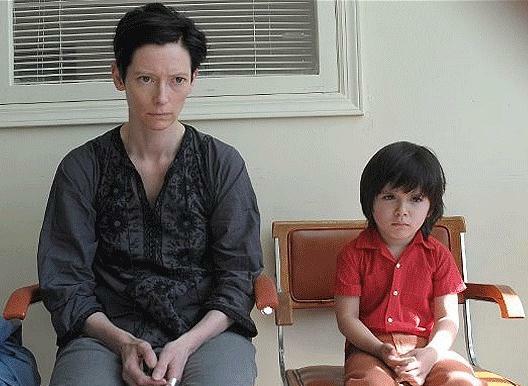 From the moment he’s born, his mother (Tilda Swinton) looks like she’s been stabbed. Every loveless moment with her son is a fresh wound. He cries incessantly as a baby. He refuses potty-training. He never says a kind word. And she hates him, sometimes. She could almost take a knife to his throat. But only a monster refuses love to their child. She is a monster (in her own eyes). And her son grows up and commits mass murder. Is he so heartless because he was never loved? You should see this film, if only for the colour palette. Director Lynne Ramsay and her cinematographer, Seamus McGarvey have outdone themselves. Not since Francis Ford Coppola’s Dracula has a film been so extravagant in its use of red: red toys, red tins, red clocks, red walls. In a flashback to Kevin’s mother’s wild youth, she’s pictured at La Tomatina, an annual tomato festival in Spain, where thousands of people gather to throw tomatoes at each other. It’s a frenzied scene, where all that juice looks awfully like blood. You feel sickened as you watch. Like Kevin’s mother, you can’t escape the way blood sticks. The hollow house where Kevin’s family lives offers no protection: it’s as empty of furniture as it is of warmth. Lynne Ramsay is unrelenting throughout in making her film uncomfortable. It’s not a pleasant viewing experience, but it is impressively stark. Tilda Swinton has never looked more haggard than she does here. She resembles more the Ancient Mariner than a suburban mom. It’s the look of someone cursed. She’s Rosemary from Rosemary’s Baby, with no choice but to raise the devil’s offspring. What can she do? She’s his mother. The best scene in the film comes right at the end, when she asks Kevin “Why?” and hugs him when he says he isn’t sure. Finally (finally!) there’s a crack in his façade. He’s her boy, at last – but only, tragically, after he’s become a killer. Before that, he labels a disc of computer viruses with the words “I love you”. He knows, like she does, that love can be a virus: that it can remain in a host, even as the host goes out and kills. Ezra Miller is so hateful, as Kevin, you want to strangle him with barbed wire. He perfects the loathsome quality of being smug. The film barely gives him a second where he doesn’t act like a prick: either he’s tormenting his little sister, or snarling at his mom. The right-wing pundit in you will be lining up a cross hair every time he’s on-screen. And yet, that’s the point. The film doesn’t seek to make excuses for Kevin, or to absolve him of blame. He’s a monster. I only wish Ezra Miller looked more like Tilda Swinton, so we could get more of the right effect. He’s a monster, but he’s born of her. When his mother looks at him, she sees part of herself. Deep down, both Kevin and his mom know they’re inseparable. You remember how, in Ordinary People, it all came down to the fact that Mary Tyler Moore didn’t love her son? We could have been spared the whole movie (hallelujah) if she’d just said, “I’m sorry, Conrad, but I loved Bucky, not you.” We Need to Talk about Kevin is, essentially, Ordinary People…with a killing spree. It’s a much more brutal film than Robert Redford is capable of making. Lynne Ramsay demonstrates once again that she’s willing to look at what the rest of the world shuns. As a director, she’s drawn to outsiders. In her previous films (Ratcatcher, Morvern Callar) it was blighted youth that caught her interest. Here, she wants to look at a blighted mother. The message is: parenthood can be a curse. This entry was posted on Saturday, November 5th, 2011 at 10:56 am and is filed under British Film, Film Reviews. You can follow any responses to this entry through the RSS 2.0 feed. You can leave a response, or trackback from your own site. Having read a few reviews about this film, I won’t be going to see it. Its actually perplexing to me why anyone would want to make it, and anyone would want to see a film which is such a downer as this in these times of recession and other world turmoil. Wow, I bet you’re a blast at parties.